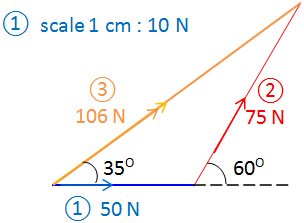 In a vector diagram, a vector quantity is represented by an arrow. The direction of the arrow is the direction of the vector quantity. In a vector diagram, we use a single vector called resultant vector (or net vector) to represent the individual vectors combined in terms of magnitude and direction. A resultant vector is indicated by a double-headed arrow while individual vector is a single-headed arrow. Note that the following illustration is associated with forces but vector diagram is applicable to all vector quantities like displacement or velocity and so on. To help you understand this better, you can play with the below applet. 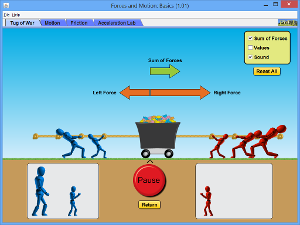 (1) After opening the applet, choose Tug of War to start. (2) Select all the boxes at the top right corner to see the values. (3) Drag and drop one small blue man to the left of the trolley and click go. You will see the resultant force (sum of forces in the applet) is same as the applied force as that is the only force applied to the trolley. (4) You can now pause it, and drag and drop one big red man to the right and then click go. You will see now the resultant force is the difference of these two applied forces, and trolley moves in the direction of bigger force. (5) You can play this applet with any combinations by simply drag and drop the blue and red men to respective side. Enjoy it! A detailed illustration on these two methods is shown in the example below. Consider two forces that are not acting along the same line (i.e they are not parallel) on an object, find the resultant force. Step 2: Complete a parallelogram to scale. ﻿Step 3: The resultant force is represented by the diagonal of the parallelogram. Find the magnitude and direction of the resultant force to scale. Step 2: Where the first arrow ends, draw another arrow to represent second force (75N), so that the tip of first arrow joins the tail of second arrow. ﻿Step 3: The resultant force is found by joining the starting point of first force to the end point of second force. Find the magnitude and direction of the resultant force to scale. Note that when there are only two forces and you are asked to find the resultant force, you could proceed with any method by following the steps mentioned above. However, when a system is in equilibrium (normally there would be three or more forces), it is much easier to use Tip-to-Tail Method. Refer to Example 2 Tip-to-Tail method (b). A weight W of 8 N hangs from the end of a rope. It is pulled sideways by a horizontal force F of 5 N and is held stationary. What is T? ﻿For it to be stationary, resultant force is 0 N. So T must balance out the resultant of W and F. First, find resultant of W and F by following the steps discussed above, then determine T.
(1) T is in the same magnitude but in opposite direction as the resultant of W and F.=> system is in equilibrium. (2) For Tip-to-Tail method (b), all arrows are single-headed and flow in one direction. Note that in Tip-to-Tail method, the resultant force is drawn from the starting point of first force to the end point of last force whereas the equilibrium force is drawn from the ﻿end point of last force to the starting point of first force﻿. (a) What is the resultant force for the above system? (b) How to make the system stationary?